Although all tea kettles perform the same basic function – boiling water – not all are created equal. There are a variety of features to consider when choosing the best one for making tea. You must consider whether you are after an electric or stovetop model, what your ideal size is, how impatient you are for hot water, and how long you want the water to remain hot so you can keep coming back again and again to refill your cup. 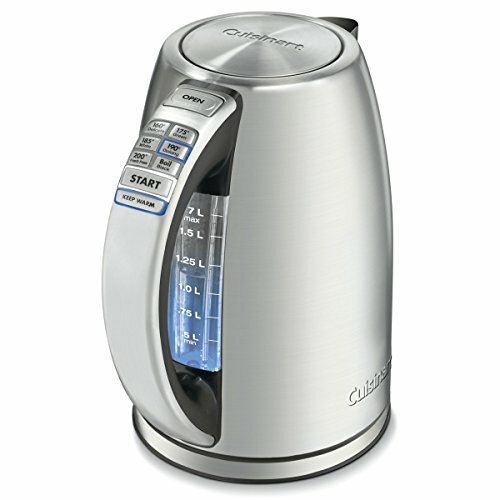 Our top pick is the Cuisinart CPK-17AMZ Perfect Temp Cordless Programmable Kettle because it offers accurate temperature controls and can be used anywhere with an electrical outlet. Packed full of handy features like a water filter, temperature hold, and auto shut-off, this is a great all-rounder. Although for some the design of this model may be a little too contemporary, we give it a big thumbs up for substance over style. 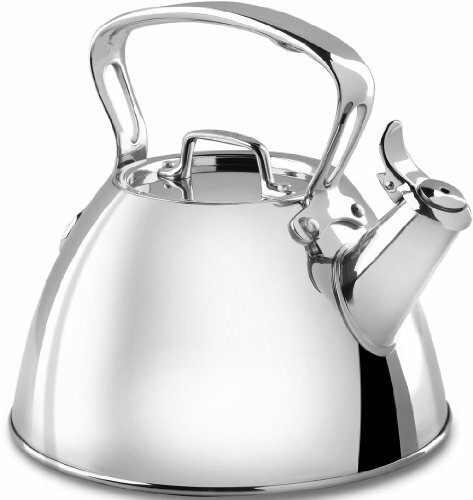 All-Clad’s two-quart kettle is made of pure metal and is very stylish yet traditional. There aren’t any silicone handles or spouts here, just 18/10 stainless and a variety of other metals chosen to distribute and retain heat. It’s compatible with induction ranges for rapid boiling. The base is flat and large enough to absorb all the heat from your burners. The whistle is reliable and firm, although it may lack in volume somewhat. You’ll have to stay nearby to hear it, which can be rather inconvenient if you’re off in other areas of the house. Because it’s made entirely of metal, when it’s done boiling, you’ll absolutely need to use a potholder to prevent scorching your hands. If the All-Clad stainless steel kettle is within your budget, it’s a strong pick. This traditional kettle is solid metal and may last you for years when taken care of. Willow & Everett’s kettle weighs less than three pounds when empty. It holds a bit less than three quarts of water when full, netting you about 11 teacups full of tea. The whistle is clear enough to be audible from the next room without being shrill or irritating. The kettle itself is made out of thick layers of metal and holds heat in for a surprisingly long time after boiling. If you pour a cup of tea and come back fifteen minutes later, you can heat the remaining water to a boil in a minute or two. The spout lever opens easily with gentle pressure from your index finger. The base of this kettle is a bit larger than competing models, enabling it to soak up the full heat from your burner. It’s designed to work with induction cooktops as well as conventional gas ranges. The spout is long enough to pour easily without dripping, and a tight seal around the spout means you’ll have less chance of accidental leaks once you’ve closed the lever. While this kettle has a silicone handle, it’s too hot for bare skin for a couple minutes after it whistles. You’ll want to either wait a bit – you shouldn’t lose too much temperature in your water – or use a pot holder. It shouldn’t leak during “normal” operation, but if you overfill it, it’s prone to spout water from just about everywhere as the water heats up. Willow & Everett have thoughtfully provided a tea infuser for use with this kettle. 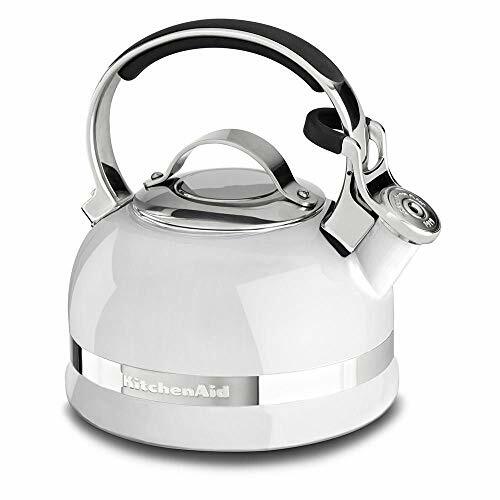 It’s stylish and practical, making it a great option for most homes that need a conventional kettle. The Cuisinart CPK-17 electric kettle has a capacity of about 7 cups or 1.75 quarts. It’s slightly smaller than the other traditional kettles we’re reviewing, but 7 cups is still a generous amount of water for tea. Cuisinart has packed this bad boy full of everything you might want in a tea kettle. It has a built-in water filter, the ability to hold just about any water temperature you’d want for tea or coffee, a 30-minute temperate hold, and a window that lets you view the water level from the outside. It shuts itself off when it’s done and remembers the temperature setting when you remove it from the base. This all comes at the cost of appearance. This Cuisinart is made from burnished steel with buttons everywhere. It’s not entirely unattractive, but it looks very much like a modern tool. You won’t be purchasing one of these to beautify your kitchen. The outside of this unit gets a bit hot when in use. It won’t burn you, but you’ll want to maneuver it using the handles and avoid touching the outer wall for quite some time. While it has a wide range of programmable temperatures, it tends to overshoot them by about five degrees. It’s still a lot closer to optimal temperature than a traditional kettle – unless you use a thermometer and a whole lot of patience. Five degrees probably isn’t noticeable for the average tea drinker. For serious tea or coffee enthusiasts, this style of electric kettle is a clear winner over any other option. KitchenAid offers a colorful selection of two-quart kettles that add a bit of old-fashioned character to any kitchen. They weigh about three pounds when empty and are constructed from steel sandwiched between porcelain enamel layers on both the inside and the outside. The thumb flip on the spout is uniquely satisfying and effective. Unlike some other kettles, it snaps open and stays that way until you’re done pouring. The biggest issue with this kettle is the whistle. When it works, it works. It’s a bit quiet and ambiguous compared to some other kettles on the market, but the sound is shrill enough that you’ll investigate the source soon enough. The issue is consistency. With too little water, you don’t seem to get enough steam to make noise. Luckily, the kettle is pretty small, so you’ll be using it more than half full most of the time. You’ll need to be a bit careful when heating this kettle, as the spout contains pieces of plastic which may be prone to melting with extreme temperatures. The silicone on the handle stays quite cool but the metal around it can still get quite hot. You may still find yourself having to use a potholder. If you want a functional, traditional kettle that is available in bright colors, the KitchenAid two-quart kettle may be a solid choice. 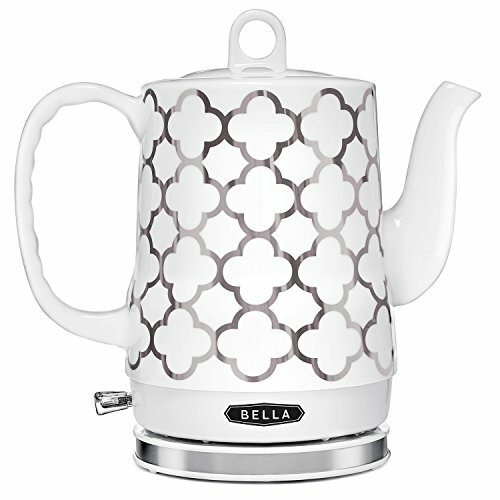 This BELLA electric kettle is a 1.2-liter kettle (about five cups). This is half the capacity of the Willow & Everett and two-thirds of the capacity of two-quart kettles. 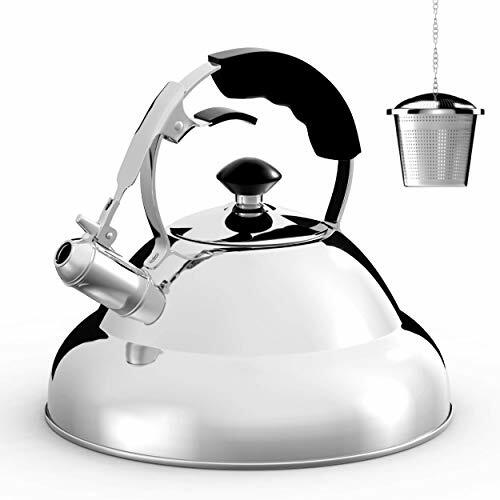 However, this pretty tea kettle offers something dramatically different than a traditional stove-top kettle, but it’s still reminiscent of something your grandmother might have owned. Lead-free ceramic keeps heat in incredibly well long after it has been heated, and helps heat water more quickly than plastic models. Downsides include the lack of loud notifications when the kettle is done boiling and some slight drips when pouring if you aren’t careful. The kettle practically boils as you watch it. The only signs it’s done, however, are a very faint click as a lever depresses and a light turns off. It’s easy to miss. Excellent heat retention and automatic shutoff mean this isn’t too important. If you remove the kettle from the base while heating, it’ll resume operation as soon as you return it. Finally, this kettle is quite heavy. It’s less than five pounds when empty, which is more than any of the traditional kettles above. When full, it’s closer to eight pounds. It should still be quite comfortable to pour from, but it’s worth noting that it’s somewhat heavier than you might be used to.